I only heard about the girl called, Sara Khan and about her brother, who was held in Syria, from few of my friends from older years. I don't know why I didn't do anything about it or it didn't hit me how serious the situation was! I only found the Facebook page today because I thought of doing little bit of research on it! I am absolutely ashamed at myself! I could have done this earlier and contributed and added my help as much as I could! It is so stupid that the "death" grabbed my attention. This shows how we all wait for something drastic to happen in order to do something about it. The media hardly helped the poor family and I feel I should have looked him up and read up on him! I feel so regretful to not help back then! Sooo stupid that it only captured my attention now! :( SO STUPID OF ME! I would like to urgently bring your attention to the plight of my brother and beloved father of two Dr Abbas Shah Khan who has been missing in Syria since the 22nd of November 2012. Dr Khan was born in BRITAIN but his family originates from India. Dr Khan has been working successfully in the NHS for the past six years training to become an orthopaedic surgeon. He is happily married and a father totwo young children aged 5 and 6 years. My Brother has always held an interest in relief medicine which he felt was the responsibility of every individual with medical expertise. On the 12th of November Dr Khan travelled to the Turko-Syrian border again taking with him much needed life saving medical supplies. After gaining recognition from the locals for his kind nature and expertise my brother was requested to cross the Syrian Border in order to assist those with injuries too great to travel. It is at this time that news began to emerge of the deteriorating humanitarian crisis in the Aleppo Metropolitan area. Having witnessed the horrific injuries of those fleeing the area, my brother put his own life on the line and ventured to Aleppo answering the call of fellow doctors based in the area. On the morning of the 22nd of November, Dr Khan was travelling between hospitals and it seems he got lost on his journey and has been missing since. After a day with no contact from Abbas, we, as a family became increasingly concerned about him. 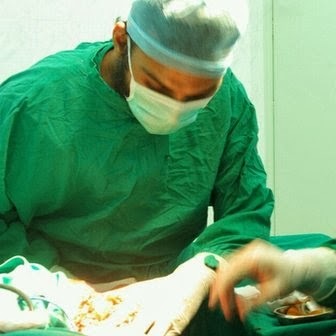 It has now come to our attention that he has been HELD by the Syrian Government simply for treating the injured. It has now been 10 days and we have heard absolutely NOTHING from our brother or his captors. He was due to return to his family who love and cherish him dearly on Saturday 24th November. This ordeal has been agonising for his wife and two young children. I would like to re-iterate that my brother is a humanitarian aid worker, who alongside international aid organisations had gone with the sole purpose of helping anyone and everyone who is suffering regardless of creed, religious or political background. PLEASE like and SHARE this page to raise awareness and any information on Dr Abbas Khan's unjust capture. We are appealing for assistance from organisations who will be able to aid in pushing for his release from the Syrian Government and returning him home to his loved ones. Support from everyone is greatly appreciated and a collective front will hopefully push the British and Syrian authorities to release him. Day 18: Thank you for all your thoughts and prayers. Still seems the authorities are reluctant to help my brother. The reasons for their inaction remain a mystery. The Syrians have requested a letter from the government although they still deny his detention. We as his family request everyone to spare five minutes and email their local MP requesting that they urge the FCO and William Hague. A man who left the comfort of his own home to help others now needs the help of his country. If we all bind together then we might make a difference! Please continue to support our struggle. As the days pass by since my brother has been captured, it is becoming increasingly difficult to remain positive. The stability of the Syrian government is deteriorating rapidly, ministers are defecting and there is complete decomposition of infrastructure which are in Syrian government stronghold regions. I have no idea if my brother is in these areas and how this will affect my brothers detention either. This is a man who left the comfort of his home, his stable job and secure daily routine to go and help those who were so wounded that they were unable to even make it to hospitals let alone refugee camps. He now needs your help. Please, please help by writing to your local MP and aid in lobbying them to urge the Foreign Office and other government officials to get my brother back. Dearest Friends, my heart breaks to confirm that my brother Abbas, my hero, my bhaijaan was been killed yesterday in Syria four days before his release. My brother was taken from his prison and taken to an unknown location where these callous monsters stole my brothers life from him and shattered my family's hope, dreams and strength. Please do not put trust in the absurd allegations the Syrians are claiming, my brother would not and has not taken his own life. He was looking forward to coming home to his loving family and to seeing his kids and had written to us telling us this a week ago. My heart aches every time I have to think of what he felt in his last moments. Words cannot describe how we are feeling. I could never have dreamt for a better brother for anyone. He was incredibly selfless and had the purest heart someone could have. I feel a part of me has been taken forever and not sure how we will ever recover from this. I implore you all to help the family in helping repatriate my brothers body to the UK. We still need your help my friends. He is not free until he is home. God! It was so hard for me to go through these post knowing what happens in the end. We cannot even imagine what might be going through the family right at this moment. They struggled for a year in hope for the innocent man to return to his home and still struggling to get his body home. It breaks my heart to even think about all the torture the innocent man went through! I can only imagine and feel sorry and angry. I don't know how the family coped for an year so patiently! There is not one post which is written out of anger....all of them are full of love and hope! The poems by the wife and letters/ drawings by his kids! aah IT IS SUCH A GREAT LOSE! Words cannot describe how sad it is. I feel so guilty that I didn't do anything about it! Even if I shared a post to help I would have felt a little better. I don't know why it didn't get to me! aarghh so angry at myself and everyone else who didn't do anything about it. All I can do now is pray to god to help the family through this difficult time and let the innocent man rest in peace. May God (Allah) heal their pain, help them stay strong and give them peace.